This beautiful picture book is perfect for reading before bedtime to set up your child for imaginative dreams while they sleep. Or read this book before they head off to the land of make-believe for lots of playtime inspiration. From volcanoes that spew bubble gum to animals that change their coats whenever someone sneezes, this book is full of imagination. The dreamy illustrations are soothing and yet full of mystery. 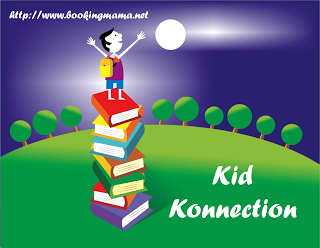 Imagine your child climbing to the tallest lighthouse and drawing out new galaxies with their finger. That is the kind of magic you can imagine by reading this book. 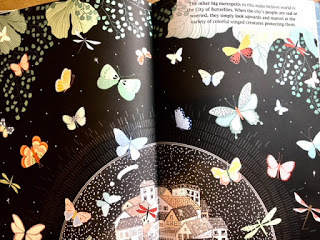 My favorite page shared a sky full of butterflies that when we are sad, we can look up into the sky and be amazed at the variety of colorful butterflies protecting us. I felt calm just by reading this book to myself. I can’t imagine how much a child would love reading this and looking at the pages full of make-believe. 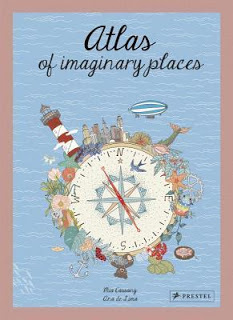 So many kids don’t know how to pretend or play make-believe so this book could be a great way to inspire children to think out-of-the-box and have fun. This book is perfect for children in preschool through lower elementary. Aliens Get the Sniffles Too Ahh-Choo!